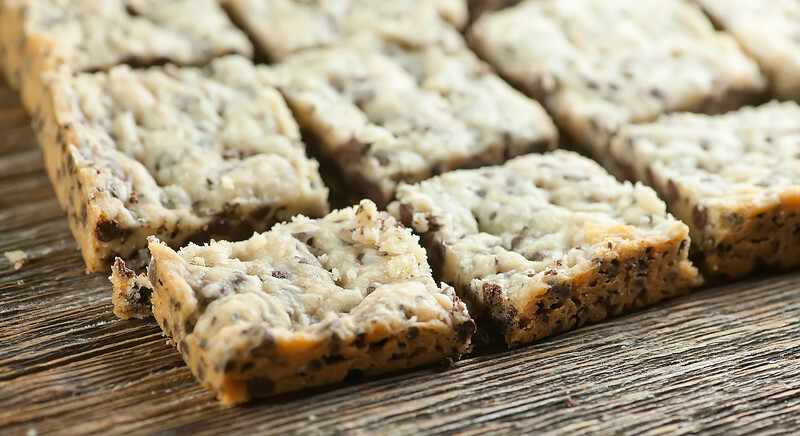 This recipe for chocolate chip coffee shortbread is a must for your holiday baking list! And don’t forget to make a second batch for yourself! Ladies and gentlemen, it’s time to start your holiday cookie-baking engines! And while I know you already have a list of your favorite cookies on your to-bake list, I’m here to add another one with this easy recipe for chocolate chip coffee shortbread. 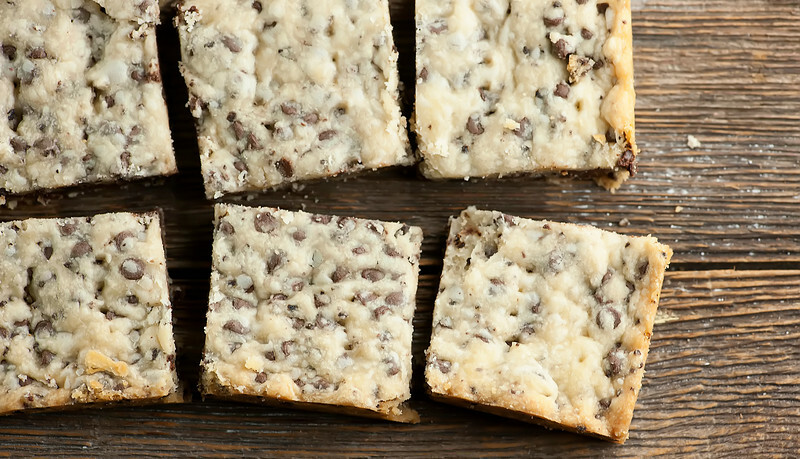 Tiny chocolate chips and a hint of coffee flavor all collected in a buttery, melt-in-your-mouth shortbread. And to add to the wonderfulness, the whole batch bakes up in one pan, so there is not even any cookie dough scooping needed. It’s the chocolatey gift that keeps on giving! Shortbread in its purest form is a simple combination of flour, butter and sugar that bakes up into a lightly golden, rich and crumbly cookie that is perfect with a cup of tea. This version takes that tradition recipe and sasses it up just a little by adding instant coffee granules and mini chocolate chips, both of which work perfectly with the buttery shortbread taste. 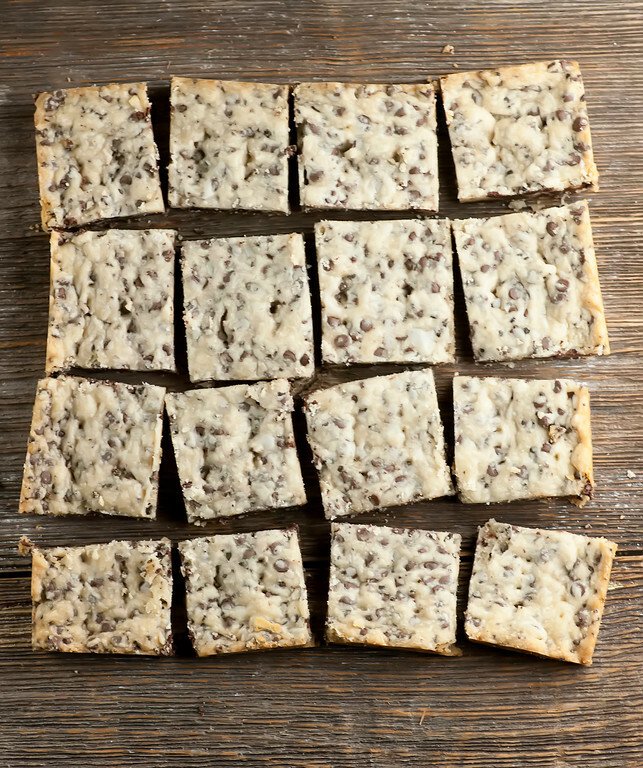 This recipe for chocolate chip coffee shortbread is a must for your holiday baking list! And don't forget to make a second batch for yourself!Click to TweetYou press the simple dough into a parchment-lined 8×8 square pan, and bake them until they are just golden. Cool them off a little and cut them into squares, and that’s all there is to it. Easy, merry cookie deliciousness that you can either give away to some lucky person on your list…. …or that you can save for your own self. Because the baker needs delicious cookies too! Preheat oven to 325 and line the bottom of an 8×8 baking pan with parchment. Put the butter, flour, sugar, vanilla and coffee in a mixture and mix on slow speed until everything is well-combined. Add the chocolate chips and mix for a few seconds on slow until they are mixed into the dough. Press the dough evenly into the pan, making sure it reaches the edges and is smoothed out on top. Prick the dough every couple of inches with the tip of a sharp knife. Bake until just starting to turn golden, about 30 minutes. Cool in the pan. When the shortbread is cool, cut into even squares. Thanks Beverley! Simple is my motto during the holiday whirl! These shortbread cookies look amazing, Kate! I love the combination of chocolate and coffee. Just perfect for the holidays! Looks really good and really easy. My favorite combo! Think I could sub in instant espresso powder for the instant coffee granules? Use the same amount or cut back on it a little? So funny that you mention this – the last time I made these, I did use espresso powder, and they definitely had a stronger coffee flavor (I used the same amount) – which tasted great to me! But if you want to keep the coffee flavor mild, I would use a little less espresso powder. Well then, I will take the “less is more” route and scale it back a bit to see what I come up with. Going to have to try these this weekend while I am doing some holiday baking. Thanks! Shortbread is MAJORLY underappreciated in my opinion, but I love it!! The chocolate coffee combo sounds divine. Shortbread is on my list every year. Got to love that butter goodness. This looks delicious! Shortbread is so easy but so good, right? Can’t go wrong with flour, butter and sugar! Especially when you add instant coffee and chocolate chips :) Looks delicious! Chocolate Chip Shortbread is my FAVORITE. This is gorgeous!! And the coffee flavor, love it! Thanks Dorothy! Chocolate and coffee make everything better.